Not content with the knowledge that Modern Warfare 3 was always going to sell a ton more copies than supposed rival Battlefield 3, gaming research firm Raptr decided to track how many hours people spent actually playing both games. Using a combination of data from a 10-million "gamer network" and a 6000-person survey, Raptr found that "users logged an average of 40% more playtime in Call of Duty: Modern Warfare 3 (Xbox 360 version) than Battlefield 3 on the respective games' launch days". Much of the other stats say largely the same thing. 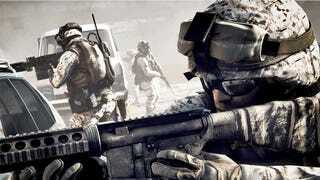 That more people spent more time playing Modern Warfare 3 than Battlefield 3. Shocking, I know. But here's a single interesting find: "53% of Battlefield 3 players on Xbox 360 are also playing Call of Duty: Modern Warfare 3". The so-called rivalry between two actually quite different series did nobody any favours, least of all EA, consumers and message board moderators. It's nice seeing that "rivalry" put in perspective.